Announcement Update April 17, 2019: Bookings are now only available from June 9, 2019 and later. If you require a collection before June 8th, please message me directly so we can check the schedule. Thank you! Update April 16, 2019: Rush orders are now available only for wedding dates that are June 1, 2019 and beyond. Rush orders are filling up very fast so if you have a wedding date that is rapidly approaching, it is important to contact me **first** and see if we can book your wedding collection prior to ordering! :) Also, please note that USPS Express shipping may be required in order to make sure you receive your order on time! Update March 28, 2019: Rush orders are now available only from April 25th and later, and they do fill up quickly! There is also limited availability for bookings in June and July. Please message me with your wedding date and "need by" date so I can make sure we have you booked and can ship your order on time :)! From all of us here at Pine and Petal Weddings, we wish you a Happy New Year with the hope that you will have many blessings in the year to come! For our New Year’s resolution in 2019, our promise is, always has been, and always will be to make every single bride feel special, have individualized attention, and most importantly make their dreams come true! We want every bride to feel *appreciated* and have their vision of the perfect wedding come to life. We achieve this by giving you limitless bouquet and arrangement possibilities! You start off with a blank canvas and build your perfect wedding collection from scratch. Our custom collection truly means customizing your arrangements to *precisely* the way you want! Once you have your vision ready for us, our team of designers gets to work to bring your creation to life. We strongly believe in no compromises, which means we *never compromise* on quality and we *never compromise* on service! We only use the highest quality material for our flowers and fillers and we utilize a proprietary dyeing process to insure consistency, evenness, and accuracy! The results are gorgeous natural-looking custom-made bouquets, centerpieces, and more that is sure make your heart fill with happiness! We pair your gorgeous custom creation with our unparalleled customer service. Every step of the way, we will be right there with you! We want you to be in *love* with your bouquets and arrangements as they provide you with enjoyment for years to come. Our delicate flowers are made from organic, eco friendly materials including wood (sola, birch, cedar, pine), paper (book pages) and we accent using primarily preserved and dried naturals. Occasionally, we do use faux/artificial fillers or accents if the particular look we are trying to achieve isn't available through dried naturals or wood products. The majority of our wood flowers are made from a delicate wood (think of a thin balsa wood versus a hardwood), so they are perfect for beautiful flowers! Each flower is unique and WILL CONTAIN NATURAL OCCURRING CHARACTERISTICS such as wood grains, wood chips (similar to "bark") and varied colors. If you have any questions on materials along the way, let us know. Please check our listings and your receipt for accurate ship dates. All of our bouquets are carefully dyed and arranged by hand. Please note there is currently a 2-3 week processing time for all standard arrangements, 4-6 weeks for loose flowers and about an 6-8 week processing time for custom bouquets, Wedding Collections and Custom Wedding Collections. If your wedding falls outside of our 6-8 week processing time, we do currently have rush options available to accommodate your wedding! We do recommend ordering 3-6 months from your wedding, and also offer rush options if your wedding date is sooner! Please contact us directly if you have any questions! **Please make sure** to check and verify your shipping address during checkout as we will ship to this location provided to us. Spread the excitement and share us with your friends! 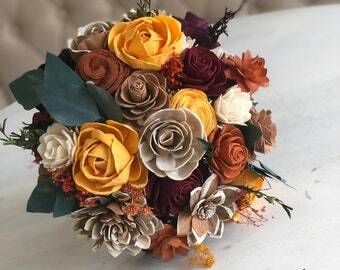 Wooden Flower Bouquets, Wood Sola Flower Bouquets, Eco Friendly Flowers, Special and Unique Home, Wedding and Event Decor. Gifts. Weddings, Anniversaries, Graduations, Holidays, Baby Showers. Update April 17, 2019: Bookings are now only available from June 9, 2019 and later. If you require a collection before June 8th, please message me directly so we can check the schedule. Thank you! Custom Centerpieces will always have a home! Shop our centerpieces or create your own. Custom orders are our favorite! Look at these beauties inspired by the 1920’s. We love seeing your visions come to life and your colors together! Custom Wedding Collections and Bouquets. Sola Flowers, Wood Flowers, Birch Flowers, Preserved Flowers, Forever Flowers. Delicate sola flowers are used to create lasting bouquets, boutonnieres and more for your perfect day! Favorite flower out of season? Not here at Pine and Petal! We can turn anything out of season - into season! 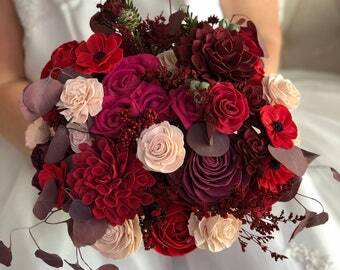 Sola Flowers custom dyed and arranged to create the perfect wedding accessories - bouquets, corsages and boutonnières. Celebrating your life events with you - beyond the bloom! Welcome to Pine and Petal Weddings! 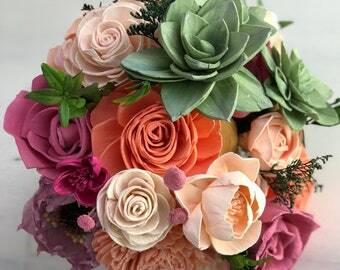 We are so glad you’re visiting our shop and love that you are also looking for flowers that are more unique than fake silk flowers and less expensive than real flowers that don't last beyond their bloom. We specialize in creating a unique, and fun floral experience. We reach beyond the everyday fresh floral décor and build delicate wooden flower bouquets and décor that will last a lifetime. 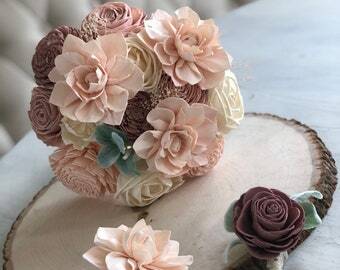 Forever wooden flowers are an amazing way to remember a favorite friend’s birthday as well as to celebrate your happily ever after with your beloved. They also serve as the focal point at the Thanksgiving dinner table and provide deep comfort in times of loss. We go beyond the bloom and partner with you in creating a piece that serves as an ever lasting reminder of your moments. Our Sola Flowers are made from a soft Tapioca Wood (much like a balsa wood). This makes them very realistic and delicate and they should be treated with gentle care as you would treat real flowers (minus watering!). Each flower has been handmade - no two flowers are the same - creating a custom piece that is uniquely yours! We also work with natural materials such as book pages, comic books, birch wood, preserved foliages, and mulberry paper. The only exception to this is our flocked Lambs Ear, which due to its nature is artificial. If you have a question about a material in your bouquet or arrangement specifically, feel free to ask! We love celebrating with you - from the engagement party to the ceremony and reception we have floral that will last beyond the celebration day! 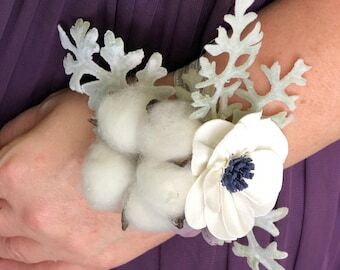 Bridal Bouquets, Bridesmaid Bouquets, hair crowns/bands and combs, as well as corsages and boutonnières are perfect for the wedding party. 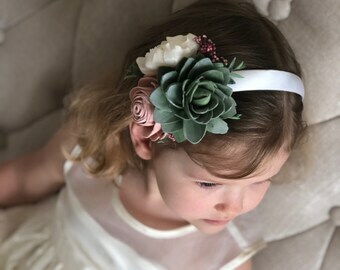 We even have unique floral creations for sweet flower girls and those mischievous ring bearers. We recommend placing your wedding collection order 4-6 months before your celebration! If your wedding is further than 6 months away, we recommend starting with our sample loose flowers or sample boxes available for each theme that you can purchase to get an idea of the theme and our flowers before you order your entire collection. Of course, you can order as soon as you like since our flowers last! PS - Find out what moving stories people are sharing about us on Facebook.com/PineandPetalWeddings and Instagram.com/PineandPetalWeddings! Wedding planning can be stressful! As one of the Creators here at Pine and Petal I love nothing more than to partner with brides, alleviate fears and help bring to life each bride's wedding collection dreams.